"Say that again Miss Moneypenny and you'll get a Klipsch round the ear"
Klipsch, our favourite AV company with a name that's begging to be said by Sean Connery, has unveiled the latest in its speaker range to keep the multimedia computer nut in your life happy – the ProMedia 2.0 speakers. The system connects up to your myriad devices – Apple iPods, other MP3 players, televisions, CD and DVD players – and you can also plug them into your 3.5mm port, so they're all set for multimedia presentations and the like. Each speaker houses a magnetically-shielded satellite, 15w power amplifier, dual 2.5in fibre-composite cone drivers and a one-inch metallised polymer tweeter. And on the control speaker, there's a bass level and volume control, and an auxiliary input jack. Klipsch's ProMedia 2.0 speakers are out now. Price-wise, you'll be looking at £119 for the pair, which is a bit of a bargain when you consider the power of the amps inside. 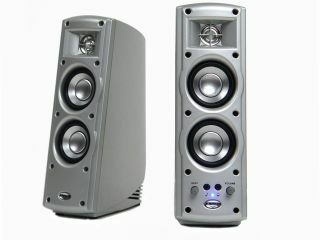 Go to www.klipsch.co.uk for more details.